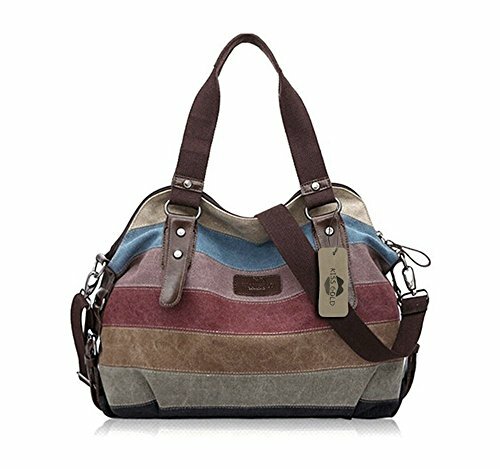 Special Features:Canvas mixed with faux leather, multi-color stripes make a new definition of fashion: casual, vintage and elegant. Have extra adjustable shoulder strap,you can have 3 carrying options (Cross-body, Single Shoulder and Totes)£¬except Model-D, Model-D can be used ONLY as backpack. KISS GOLD(TM) is US registered trademark(Registered NO. : 4734997). We produce Briefcases; Canvas shopping bags; Cases for keys; Credit card cases; Garment bags for travel; Handbags; Haversacks; Key cases;Pocket wallets; Rucksacks; School bags; Traveling bags; Unfitted vanity cases; Valises.